Today we slept in. Seems to be a reoccuring pattern now our Topdeck tour is over. No times we have to be anywhere. No one who is not me making her get up so we sleep. Anyways we got up in time and organised to go and have breakfast. Breakfast was included but it was strange. We went to the breakfast room and ordered our breakfast with the waitress. Just seemed off. After breakfast we had a few hours to kill before our train back to Dublin. We walked around the small town and found our way too one of two shopping centers. We went in and had a walk around. Shopping centers on this side of the world are just as annoying and boring as those back home. Rhian looked through clothes stores and I used free WiFi to entertain myself. After the shopping center we went back to the hotel and got our bags. We went across the canal to the bus station. The information desk told us the next bus to the train station was at 13:15. Our train was at 13:30 we were not sure if we would make it to the train in time. After just deciding if we miss the train we would buy a ticket on the next we waited for the train. Turns out the bus was fine. We got to the train station with around six minutes to spare. On the train we had a snack and I had a Heineken. 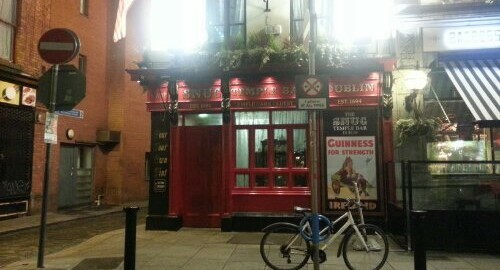 After arriving in Dublin station we walked to the hotel which was only around 1km away. Our hotel this time was on the main street of Dublin but the hotel was very basic and not fancy. However both Rhian and I fell asleep for a couple of hours. After waking from our power nap we went for a walk around town. We purchased out fridge magnets from the store near the hotel. 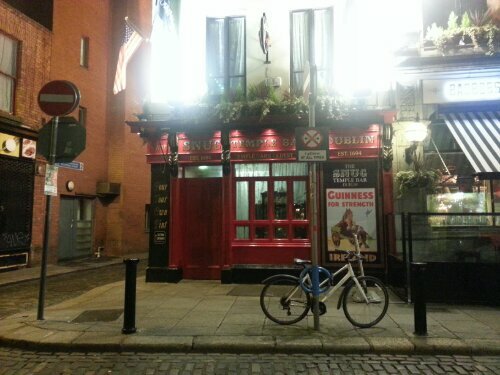 After exploring for an hour or so we found ourselves in the Temple Bar district. This is where all the toursits come apparently. Didn’t see any Aussies myself. We had dinner at a restraunt called Mexico to Rome. Food was ok but I stuffed myself and just had no room left for more beer. After dinner Rhian and I walked back to the hotel and retired for the night.